Every month we create and distribute an infographic which, in a picture, portrays important trends in the Tallahassee real estate market. As they say, a picture is worth a thousand words, and this month's picture is a worthy story. Most of the important trends that suggest growth and vitality are heading in the right direction, something that is good news for anybody with a stake in our housing market. 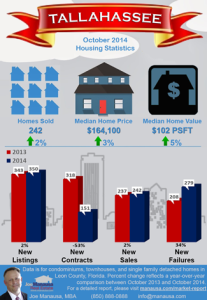 So take a look at key trends in the Tallahassee real estate market and see why 2015 might be shaping up to be a breakout year for home sales. The data for October has been evaluated and we have published the new infographic. The number of homes sold in October rose 2% when compared to October of last year. During that same period of time, the median home price rose 3% and the median home value rose 5%. The number of houses coming in to the market rose 2%, while the number of closed home sales matched that pace with growth of 2%. The number of homes leaving the market without selling rose 34% and the number of new contracts declined by 53%. There is one trend that has been observed since February of this year which does not seem to fit the picture. The number of contracts being recorded each day in the Tallahassee MLS has been on a fairly steady, rapid decline. If we were able to see the number of homes selling eventually decline, then this trend would make sense. But the opposite has been true. All the while that new contracts have been on the decline, closed home sales have been on a slightly steady rise. This means that either a bunch of homes that have been under contract for quite some time are finally starting to close, or something else is actually happening. Having studied what we believe are all the options (including a change in the way that Realtors are reporting home sales), I believe that we are seeing a glitch in our MLS system and have reported my findings to the Tallahassee Board of REALTORS and the organization that manages the Tallahassee MLS. Hopefully, we will find the bug and get this fixed, otherwise, we'll just have to acknowledge that our understanding of pending home sales (a key indicator when studying home sales in any market) is skewed and of little value. Fortunately, we can rely on the sales statistics as we have the ability to compare closed home sales recorded in the Tallahassee MLS with those recorded with the Leon County Property Appraiser's office. This means that while there might be confusion in what is happening with contracts, closed home sales can be tracked from multiple sources. We will have more on the state of the Tallahassee real estate market in this month's edition of the Tallahassee Real Estate Newsletter, please take the time to get your free subscription now.